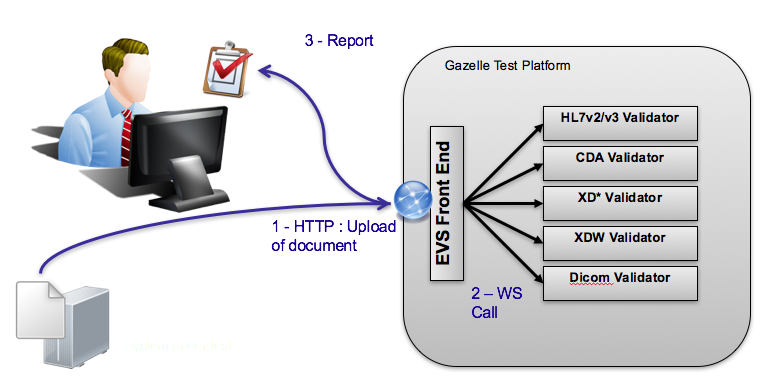 Gazelle interoperability testbed offers a large set of validation services which enable the Healthcare IT developers and users to test the conformance to IHE specifications of the messages and documents produced by their systems. All those services are available all the year long through web services. In order to increase the ease-of-use of those services, IHE-Europe also offers, through the Gazelle portal, a web-based application named External Validation Service Front-End (aka EVSClient). The tool is accessible from the following URL. Concerning the messages, documents and assertions based on XML format, we use two mechanisms. Validation can be based on schematrons or based on model. An application namedSchematron-based Validatorhas been developed, it gathers all the schematrons used by the validation tool and provides a web service to validate documents. Both Schematron and Model Based Validation of XML documents also checks that the documents are well formed and valid according to the XSD. The picture below illustrates how the EVS Client works.